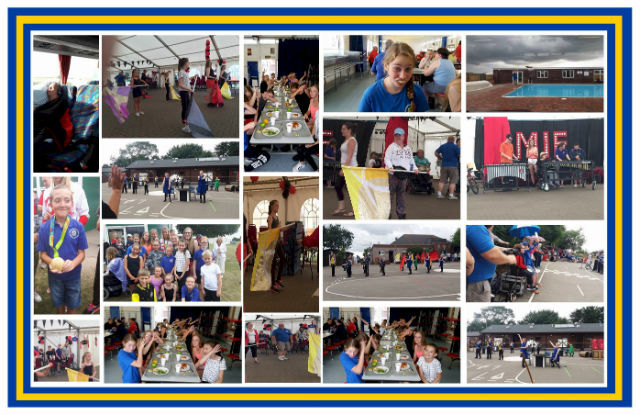 On Sunday 28 August 2016 Thurrock Marching Brass was asked to join the Mersea Festival event which saw more than 350 disabled youngsters including those with learning difficulties, who had spent a whole week enjoying all the adventures of the Mersea Island camp site. On arrival it was clear that this was going to be a special event for all involved, and the young marching band started off with a short parade to draw attention to the music and colour that they were providing. This was an extremely well run and well attended event, and the young members enjoyed an enthusiastic response from everyone present. During lunch the members were treated to meeting Olympic Sailing Gold Medalist, Saskia Clark, who allowed them to wear her Rio Olympic medal and take photos with her. A real treat for our youngsters. After lunch it was time for the entire TMB entourage to set themselves up in the big tent, where they were asked to provide a workshop for all present, showcasing each section of the band and allowing attendee participation. Any nerves about how the TMB youngsters would interact with disabled children and adults were quickly dispelled as they took a natural stance of showing them how each of their sections functionally works. We decided that we would take a popular piece of music and quickly write something for each section that we would then showcase after some rehearsal. For this effort, Fleur East’s “Sax” was chosen. The TMB staff created some outstanding on the fly interactions for the brass, frontline ensemble, percussion and colourguard, and each section integrated a number of attendees into the piece. The big tent was packed as each section worked to contribute to the overall final piece and the results were nothing short of stunning. Music is about creating sound, and after just a short period of time, it was abundantly clear that everyone involved was having the time of their lives doing just that. With amazing guard work the whole thing was one of the most uplifting experiences we could have ever wished for, and judging by the response from those listening and watching, there was no doubt in anyone’s mind that this particular session created a piece of magical involvement for all concerned. A short break and the young members of Thurrock Marching Brass set up their summer show entitled “Under New Management” for a full production run through. By this time just about everyone on camp had come along to enjoy the performance and the reception was outstanding. A great performance from the young members, and a great end to an amazing day. We would like to thank the organisers for inviting us and look forward to many more adventures in the future with everyone. Thurrock Marching Brass is proud to perform as much as they can within the community and you can keep up to date with all their engagements on our website below or by following them on Facebook. Posted by News Editor on Saturday, September 3rd, 2016. Filed under British Youth Band Association, FrontPage Feature.